When you’re working with a heat press, it’s very important to use the correct vinyl or each job. If you do not, you could find that your project comes out a lot different to how you would have liked. The main two types of vinyl you will use are heat transfer vinyl and adhesive vinyl while. While they are seemingly very similar, they do not stick equally to the same surfaces. Heat transfer vinyl is the best one to use with your heat press as it relies on the heat to fix it securely to the item. Adhesive vinyl is cut in the same way as heat transfer vinyl but is pressed into place without the use of heat. It is the method used to stick the vinyl which will decide the best one for each project. The best way to remember this is if you are working with a very smooth, hard surface then an adhesive vinyl is probably the best choice. If you are working with most fabrics or other surfaces which can tolerate high temperatures, then a heat transfer vinyl will be the best. Let’s take a look at each type and find out how they are best applied. A heat transfer vinyl is a vinyl which can only be applied with the use of heat. It is created using normal image editing software and cut to shape manually or with the use of a vinyl cutting machine. Neither side of this vinyl is sticky to the touch which is why it requires heat to activate the adhesive surface. To press this vinyl into place you will need a machine which creates heat. An iron. Some people still prefer this method to press vinyl onto their chosen fabric. Vinyl is simply placed on top of your fabric, and you press down with a hot iron. One possible disadvantage to this is that you will need to press down quite hard and ideally you will need to maintain a steady pressure over the whole area of the vinyl. A heat press. If you have one, then a heat press really is the best way to stick a heat transfer vinyl in place. The vinyl is placed on top of the fabric just the same as if you are ironing it on. But when you lower the plates together the heat press will use a steady and even pressure to firmly seal the vinyl in place. Heat transfer vinyl usually comes in rolls which you cut to the desired size. You can buy this vinyl in almost any color that you wish and you can even include finishes such as glitter or a gloss. One of the main rules before you use an HTV is to consider what you are sticking it to. The material you are working with must be able to withstand the heat of the heat press and here are just a few things that you can create with a heat transfer vinyl. Clothing such as T-shirts, sweatshirts, sweatpants, baby clothes, caps and jeans. Household items such as tea towels, placemats and tablecloths. Before you attempt to use your vinyl you need to make sure that you have everything you need. When you print your design you will need to do this as a mirror image as the side you print on will be placed face down onto your project. A vinyl cutting machine. This helps you get the best cut every time. A weeding tool. This is a specially designed cutter (amazon link) which helps you remove any blocked in areas of vinyl. Heat. As already mentioned you could use an iron or heat press. Before you attempt to apply your vinyl here are a few tips to help you get it right. Always do a test first. 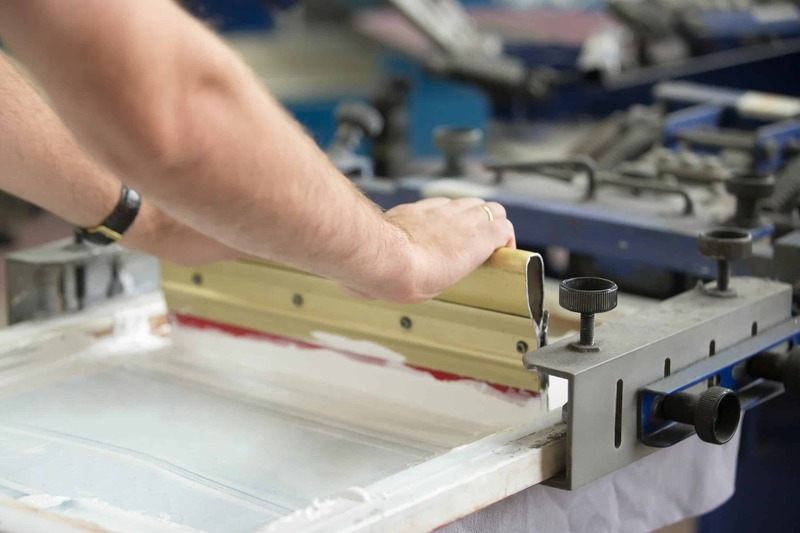 Before you mass-produce any item do just a small test to make sure that your vinyl will stick securely to the medium you are working with, and that you have the right time and temperature for each job. Clean your fabric. Your HTV will stick better if you are working with a clean surface. If you are using fabric wash, dry and iron this so that the surface is flat and smooth so there will be no wrinkles when your vinyl is applied. Be prepared. If you are looking to produce a number of the same items you will work more efficiently if you are fully prepared and everything is cleaned and lined up on your workbench. Make sure you have an area where the finished products can cool and allow the vinyl to set. Check out some awesome tips below from Daily Craft Vinyl. Adhesive vinyl is very similar to a sticker. One side is sticky and it is applied onto the surface by simply pushing down to apply pressure. 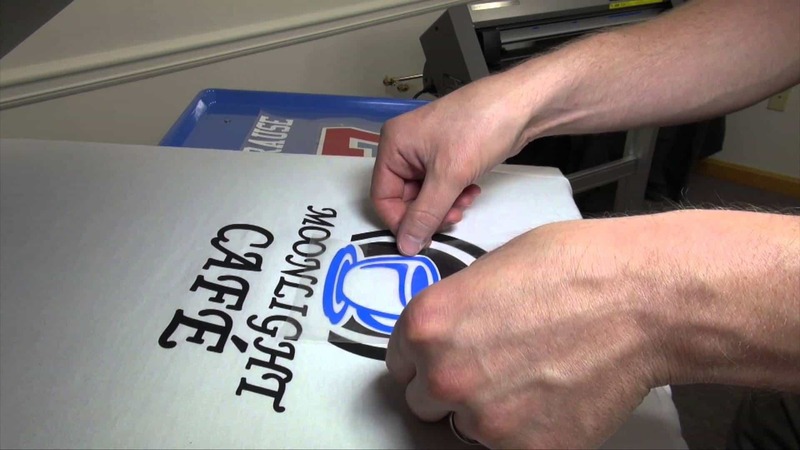 Your vinyl can be prepared in the same way as a heat transfer vinyl and cut to shape. As you are simply relying on the strength of the stickers adhesive surface you are somewhat limited into how you can use this sort of vinyl, but you can still create a large number of items. You will not need any equipment to press this vinyl in to place, but once it has been cut but you will need to be able to apply good pressure when sticking into place. When choosing your adhesive vinyl always consider your project as some vinyls are designed for outdoor use while others are better indoors. Just as with a heat transfer vinyl, adhesive vinyl is available in a wide choice of colors and different finishes. It is a good choice for smooth surfaces but is not a good choice for fabrics. While it may stick initially it will not withstand washing and will soon peel off. There are many different projects you can use your adhesive vinyl for. This type of vinyl makes a great house sign, business sign, signs for the garden or even ornamental signs for decorating the home. Working with mugs with a heat transfer vinyl requires the use of a special heat press so adhesive vinyls are a great way to design your mug and simply press your sticker into place. When using these on cups and mugs test one first to make sure that the vinyl will stay in place when the mug is washed. Household ornaments. You can give new life to your home by adding stickers to vases, pots, mirrors, windows and even wall tiles. It’s easy to make metal house, business signs or stickers for a car or van, just make sure to get an adhesive vinyl designed for outdoor use. Adhesive stickers are great way to decorate glass and mirrors as they will stick strongly to a nice clean surface. Water bottles. Adhesive vinyl is an excellent way to decorate your family’s water bottles or lunchboxes. Wood and canvas. These are not ideal surfaces for adhesive stickers as they are generally rougher and quite porous. You can use an adhesive sticker if you coat the wood or canvas with acrylic paint first. Allow this to try and you have a smooth surface to apply your sticker. Applying your adhesive vinyl requires a lot less equipment than a heat transfer vinyl. When you create your adhesive vinyl you do not have to mirror image it as this will be placed face up onto your project. A cutting machine. You can use the same machine for both adhesive and heat transfer vinyls. When you have your completed design you can simply stick it on your chosen medium. To help you get the perfect finish every time here are a few tips. Whatever surface you are working with, always make sure that it is properly cleaned and allowed to dry. A little wipe down with a dry cloth immediately before you apply your vinyl will help remove any dust so that it goes on cleanly. Test first. If you’re working with a new material, do a small test piece first. You won’t have to print whole vinyl out. Just test a small area. Avoid fabric. There is no easy way to get an adhesive vinyl to stick to fabrics. The vinyl is likely to come off during the wash and if it is used on clothes the constant movement when you wear them is liable to loosen the vinyl too. Adhesive stickers are usually cheaper to produce but if you are looking to create items for a business, it can be worth investing in a heat press and using heat transfer vinyls. Whatever you use, you can be sure that you can create some original items of your own.